Sanctuary ... inspiring songs of peace, praise and worship provides a comforting refuge of rest, renewal, peace and contentment. 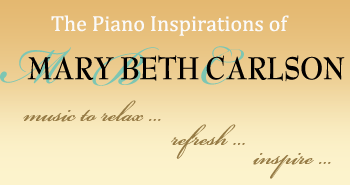 Over 70 minutes of deeply moving, captivating piano orchestral music by Mary Beth and an ensemble of world class musicians will inspire you to praise and worship God in the sanctuary where you meet Him. "When I asked Tommy Barbarella to compose an opening theme to reflect the holiness and glory of God and also to emotively introduce the awe-inspiring "We Shall Behold Him", he thoughtfully responded ... "something that says wonder". This inspired the beautifully captivating outcome I had so hoped for; a thrilling anticipation of the miraculous moment when we see our Lord face to face. Tommy created exactly what I'd envisioned to set a tone of peace, praise and worship for this CD's collection of music. I named his opening theme "In His Presence", leading into one of my all-time favorite songs, 'We Shall Behold Him'. The cover photo on this CD was a gift from my talented photographer friend, Dennis O'Hara. To me, this scene of the North Shore of Lake Superior perfectly captures the essence of Sanctuary. The serenely peaceful and ruggedly majestic North Shore inspires me to praise and worship the One who created its magnificent beauty. This sanctuary that Kent and I call our second home is our place of refuge where we lose ourselves in God's miraculous creation. We move away from internal and external pressures of change and challenge that can distract us from spending precious, uninterrupted, intimate time with the Lord. Here, in His presence, we experience a peace that surpasses our understanding as we pray and meditate on God's Word, reflect on His all-sufficient grace and thank Him for His unfailing faithfulness. We rest in a stillness before God, safely protected and embraced in the comfort of His deeply satisfying abiding love with the assurance that as His children who love and believe in Him, we will someday see Him face to face. I sincerely hope this music invites you to worship God in your sanctuary; anywhere and everywhere you meet Him. May we praise and bless the Lord in the peace of His presence from the sanctuary of our soul."